You sit down to play a game of chess. 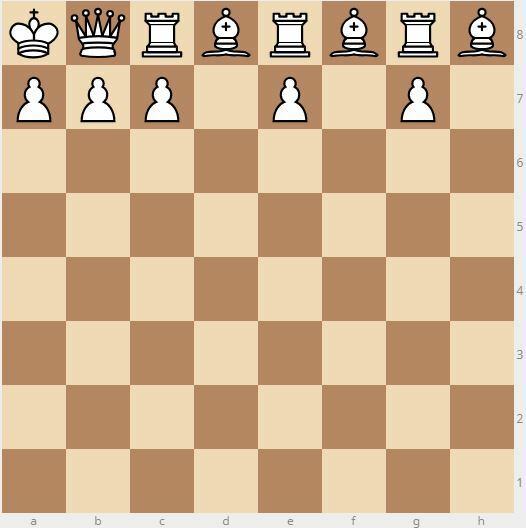 Your side has the white pieces, arranged in their regular starting positions. One problem: your opponent has left, and has taken all the black pieces! 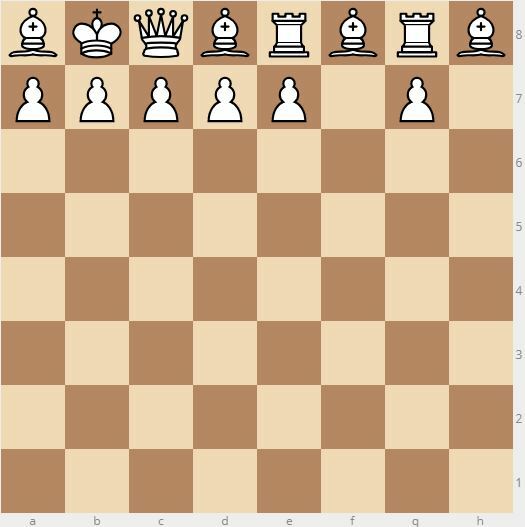 Can you, by making regular chess moves with only the white pieces, maneuver your pieces in such a way that you eliminate all possible moves for yourself? 1) No black pieces are on the board. 2) You are allowed to remove some, or none, of the white pieces from the board originally, before play begins. 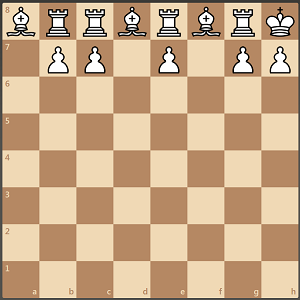 Once play begins, however, white is only allowed to make a sequence of regular chess moves. 3) There is one exception to rule #2: you must retain a King. You are not allowed to remove the white King before play begins. 4) The pieces that you originally choose to keep must begin in their normal beginning locations. So, for example, whatever pawns you choose to start with must begin on your second rank. 5) As a consequence of rule #4, you are not allowed to start with more than the usual amount of white pieces. 6) The pieces move normally. In particular, you will not be able to capture any pieces (since white pieces cannot capture each other, and there are no black pieces). In particular, capturing en passant is clearly impossible. However, you will be allowed to castle (assuming the King and Rook involved have not yet moved), and pawn promotion works as usual. 7) The point is to achieve a stalemate, not a draw. Thus, draws by threefold repetition of a position, or by the fifty-move rule, etc., do not count. In short: in order to succeed, you need to achieve a board position where no "regular" moves remain for white. According to rules 2 and 3, you are allowed to begin play with only a King. However, this choice will not succeed, since a King on an otherwise empty board will always have moves available. Posting an entire list of moves would likely be tedious. As such, you can just give the ending position, if it's obvious that that position is achievable through regular chess moves. However, if it's not obvious that your position is achievable, then you should probably give some kind of explanation, like a move list or at least a description of the tricky parts. This puzzle was inspired by @Ian McDonald's comments at: Mate in one with NO PIECES? Remove both knights and the queen. Then promote three pawns into a bishop and two rooks. 14 pieces; we start by removing both Knights. uses one or more Knights. Note that any solution which uses more than 14 pieces must use at least one Knight, so if 14 is not the maximum then there is a solution with a Knight. Equivalently, if it's impossible to use Knights, then 14 is the maximum. immediately advance your f- and h-file pawns and promote them to Bishops. Next, play g4 followed by Bg2 and Ba1. Place your other original Bishop similarly, with d4, Bg5, Bd8. Now maneuver your King, Queen, and both Rooks into position. Finally, advance all remaining pawns.